The first time I ate Jerk Chicken, was at a pop up Caribbean food stall near Haymarket Station, it was served with some tasty rice with red kidney beans and the most deliciously sweet plantain. Ever since I have been waiting to experiment and make this spicy chicken at home. Please resist the temptation of using a jerk sauce out of a bottle, it’s almost a crime because in the recipe I used from the BBC Good Food guide,it makes preparing the marinade a thing of joy. Not only will you learn how each ingredient lends its individual flavour but you van learn how to adjust the ”heat” in this amazing marinade. An advance warning, if you have sensitive skin PLEASE use gloves to marinate the chicken as Scotch Bonnet peppers are PACKED with heat. Ensure you THOROUGHLY wash your hands after you handle these ”hot babies” too! Humm now for the recipe, it’s essentially what was in the original but of course I have added my own touches and I think they make quite an impact 🙂 so read on folks. Caribbean Jerk chicken is an all-time favourite and tastes even better with a home-made marinade. Then generously apply the marinade paste all over rubbing into the cuts made to ensure the flavour really seaps into the chicken. Marinate overnight in the fridge.Cover vessel with cling film. Keep about 2 tbsp marinade aside for adding in the baking tray. When you are ready to prepare the chicken pre-heat the oven to 180 - 200 C , I have a fan oven. Prepare the baking tray by greasing with some oil ,place the marinated chicken pieces and surround them with the lime slices and place the garlic halved. Cook in the oven for about 45 minutes or until juices run clear. 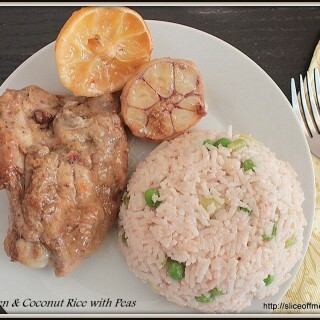 A summery delight this rice will work well with any spicy chicken or vegetable main and is a twist to the classic Caribbean rice with beans. Add 300 ml water ,mix and add salt to season. Reduce flame and do not cover completely, leave a bit of space for the steam to pass. Although the recipe I followed, uses red kidney beans since I was already using them in my Caribbean Sweet Mini Pepper Salad , I choose green peas for my Coconut Rice. I made my own home made replacement for allspice powder too , it’s very easy and I intend to make it fresh each time I need instead of the store bought one, simply because its so quick and fun to make! Actually allspice is a spice by itself but it tastes similar to a mixture of cinnamon, cloves, nutmeg and pepper. According to an article I found about allspice on About.com: ”Allspice is a spice made from the dried berries of a plant known as Pimenta dioica. A member of the pimento family, allspice is used in Caribbean, Middle Eastern and Latin American cuisines, among others. The flavor of allspice is similar to . Allspice can be used to flavor desserts as well as savory dishes. Allspice can be used in ground form or whole. Whole allspice berries are sometimes used in pickling and brining. 1 heaped tbsp Cinnamon powder or if you have a cinnamon stick take one abt the half as tall as your thumb. In a pestle and mortar mix the ingredients and grate the nutmeg into it. Then smash together to makes a grainy powder. Some bits of the clove you may not be able to grind fine, I wouldn't worry about it unless you want a fine powder then the smallest attachment on your mixer. I have an Indian mixer which I use for my coconut chutneys and it has 3 jars I used the one with 3 blades .Or else just use the pestle and mortar it should work. Store away the remaining home made allspice replacement powder in a tiny air tight container. Dark Muscovado sugar is the unrefined form of brown sugar ,its stickier ,heavier,has a longer shelf life than refined sugars and adds a more intense flavour to marinades and since it is stable at high temperatures is great for baking.If you do not have brown sugar its ok to replace it with dark Muscovado sugar. Although as the water content dark muscovado holds is higher one should accordingly taper the use of water in the recipe. 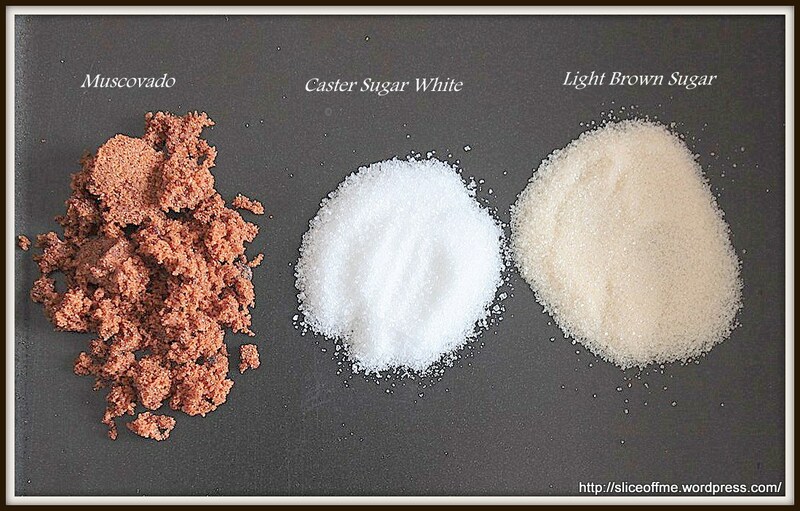 Brown sugar is white sugar and molasses and hence the colour and soft texture. It has the light and dark brown sugar varieties and the lighter it is the milder the flavour. I am linking this post to the Flavours of the Caribbean event, run by Simply.Food and guest hosted by The Spicy Pear.